Like an episode of ’24’, we packed adventure racing against the clock and illegal activity all in 24 hours. Jack Bauer would be proud. That is, if Jack Bauer can run a 5k, a half marathon, and avoid blacklisting his mother from racing. We certainly can. 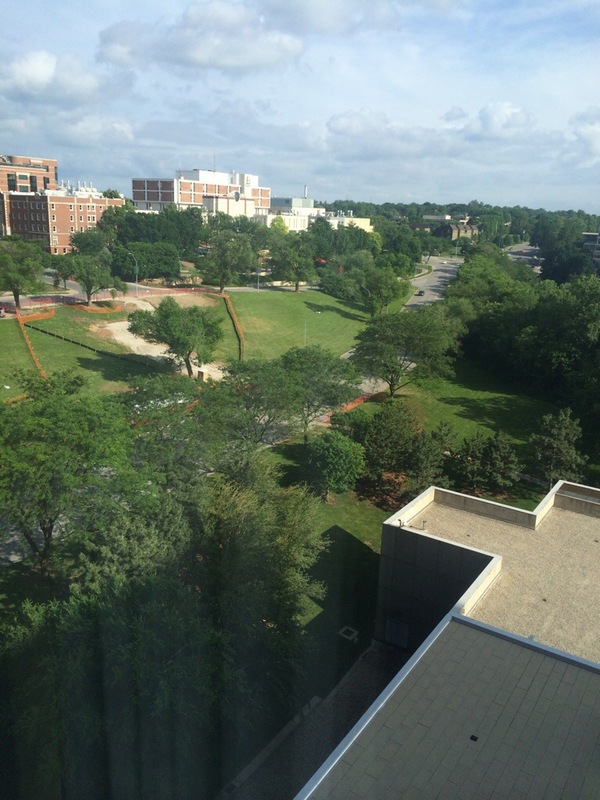 Our view from the Sheraton hotel. We look down on Gillham Rd, which is THE actual Hospital Hill. It’s a loooong one. 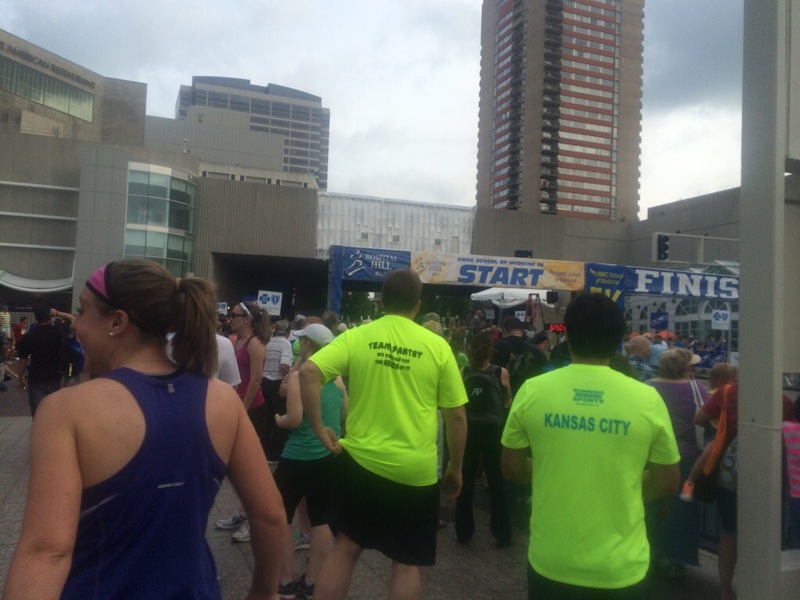 Hospital Hill Run in Kansas City is my FAVORITE race in all the world. 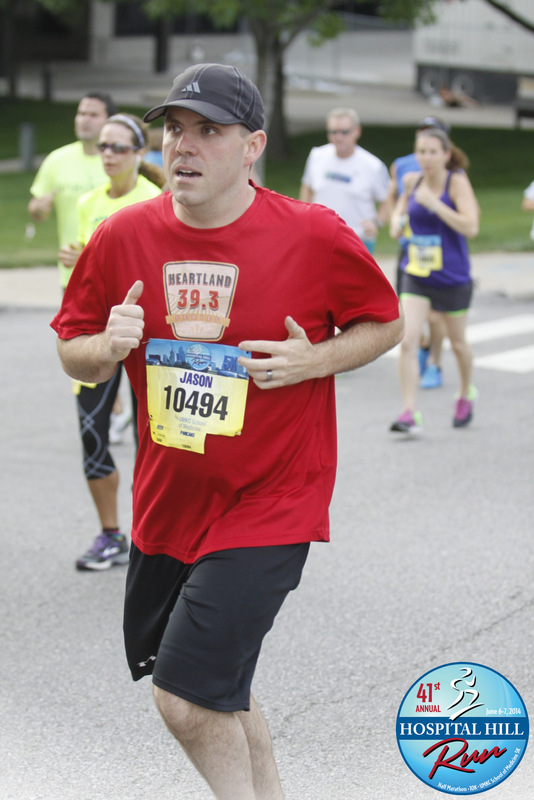 Even though I have enjoyed some out-of-state races, I still think Hospital Hill is the best and this was my 5th time running the half marathon. But wait! There’s more! This year Hospital Hill moved the 5k race to Friday night so it could be more family friendly, allow strollers, and help reduce the crowd on Saturday morning. Now this presented a fantastic opportunity for runners to pay even more money to run even more miles in pursuit of even more cool runner swag (not that we need to augment our t-shirt collection anymore but you can’t stop us from doing it anyway)! Run the 5k Friday night. 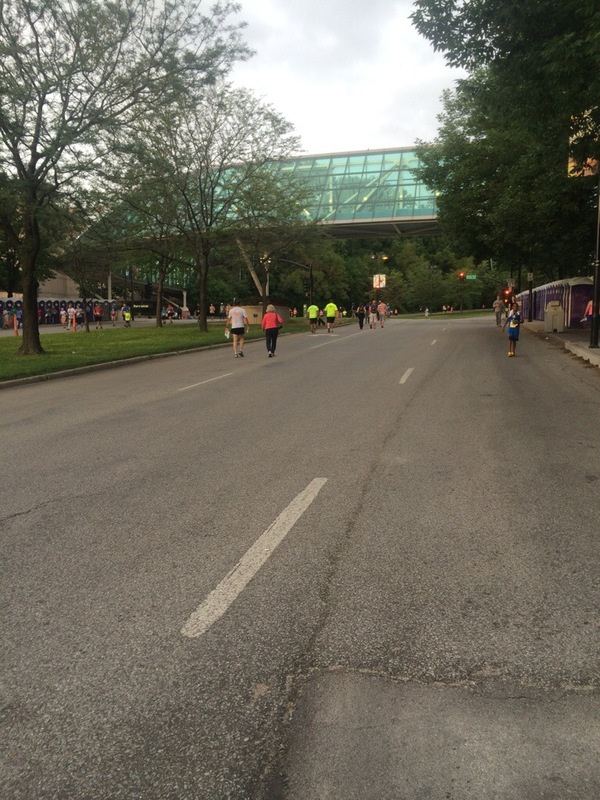 Run the 10K or Half Marathon Saturday morning. That’s, like, um, English major math here, A LOT of miles. Without much recovery. But when we heard we got another shirt and a total of 3 finisher medals (5k, half, and special re-run medal), we had to do it. Jason’s family was already planning on doing the 5k, so we would have been there anyway. Might as well get stuff for being there. 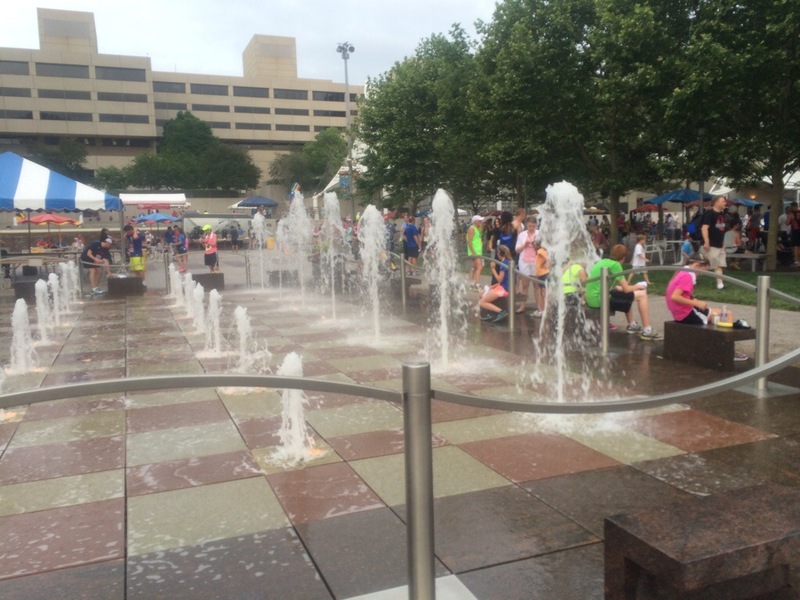 Crown Center is a great start and finish place for all 3 distances. But I probably would have run up it anyway because if I see a hill, I get this strong desire to go conquer it. Kind of like when you see a spider and have a strong desire to quickly kill it. Just kidding. You have a strong desire to scream uncontrollably until your husband or someone nearby takes pity on you and comes over to kill it. 1 medal, 2 medal, 3 medal, ah, ah, ah… The Count would be proud of the race swag we racked up! If the running world rewarded recruting the way Mary Kay does, Jason and I would be the proud owners of two pink Cadillacs. We’re like Mormons – a innocent looking pair in our official running attire, converting coach potatoes into raving runners and sucking them into our racing cult where it’s ok to drink the Gatorade. We immediately bombarded her with other races she should consider. Let’s start the 5K with this half mile hill up Pershing Road. Yes, please! 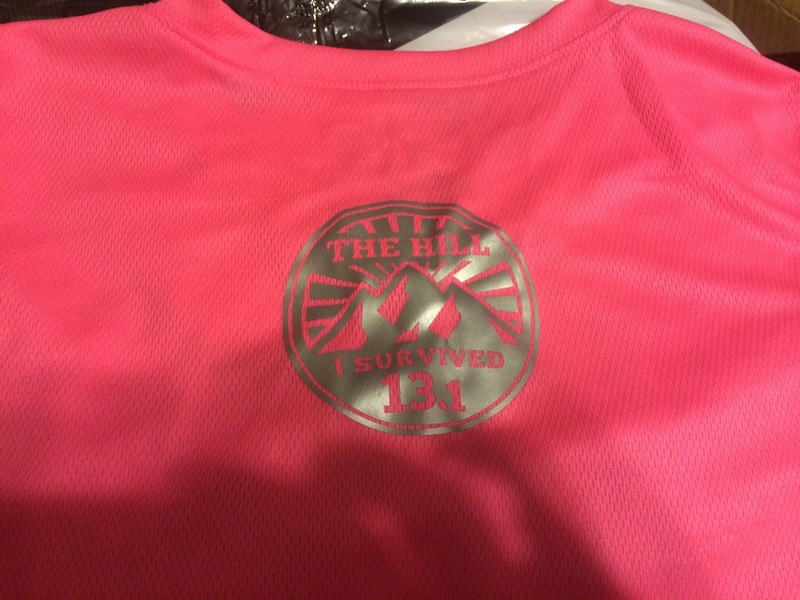 One moment I was telling her about Hospital Hill, and she said, “Maybe,” and then I sent her a picture of the finisher medal, and suddenly she’s all, “Sign me up, Scotty!” (because my mom’s a huge Star Trek fan and did an excellent job in my nerd upbringing). We had her hooked! Getting ready to start the 5k on Friday evening. Heat and humidity included, of course. The finisher medal. You had to finish to get the finisher medal. How could I find someone to run it for her and agree to give up the medal? This was certainly a perplexing quandary that was in need of augmented vocab to emphasis what a pickle we were in. Just when you get depressed about how horrible Facebook can be, it turned into a handy tool reaffirming there are awesome people out there and Facebook’s powers can be used for good and not just stalking. I posted my problem and soon had a response from my former teammate on the Blue Valley High Track Team, Steffi (check out her awesome blog In Plain Sight here). Throwback Friday! We printed these shirts in high school when our cross country team went to State in 2004. 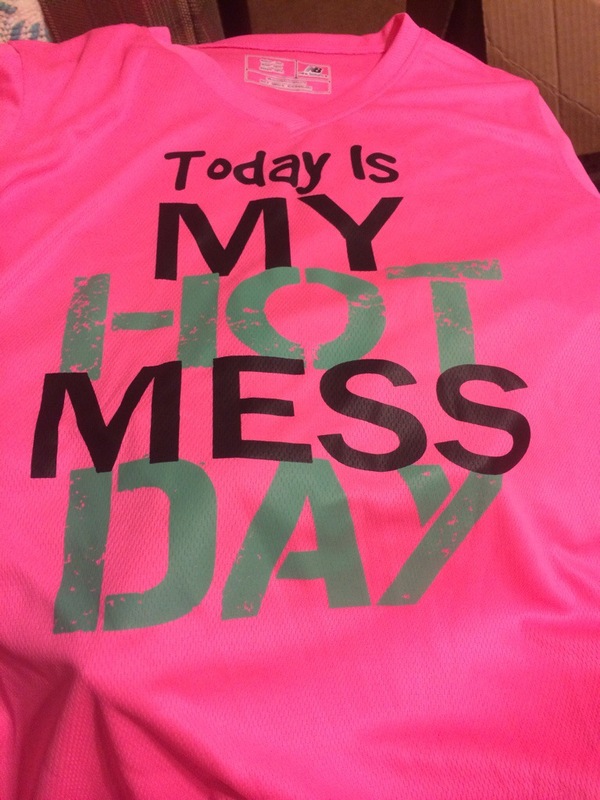 The front says “Run Like You Stole Something” and the back had our nicknames. Mine says HillMaster. This was the perfect solution. Steffi is one of the sweetest, most enthusiastic people I know. She was one of the most fun people to cheer on and talk to during track meets and practice. I really looked forward to seeing her. She was totally fine with not keeping the medal, and in return, she was rewarded with a shirt and Sheridan’s frozen custard. Jason’s got his determined I’m going to conquer this hill / try and beat Jenny face on. She also is still really fast. I mean, really fast. Like so fast she won my mom’s age group, and they quickly figured out Steffi is not a 50-something-year-old woman. We were in trouble. Big trouble. Steffi explained the situation to one of the race officials. They got her info to follow up. I told her if they needed anything else I would be happy to provide any addition info. But they were NOT HAPPY with us. They broke out the b-word: blacklist. I’ve met a few race directors, and there is a lot they have to do that runners don’t have a clue about. Running the race itself is difficult and feels like it goes on forever. Putting together the race is that times ten. You have to contact the city about the roads, hire police/security, talk to vendors, get sponsors, get legal papers and waivers and permissions, etc. So we just had someone run a race without signing the waiver – the race wasn’t liable for those who had signed and agreed to run at their own risk. Everytime I registered I knew I signed a waiver, but I didn’t realize how important that waiver was or what it really meant legally until that day. I know this happens a lot – people can’t run the race so they give their bib to a friend and no one is usually the wiser. Most runners are easy going people and know the health risks of running. If the race suddenly directed you into oncoming traffic, then we would care and have violent flashbacks of playing MarioKart. It is frustrating though – you spend a lot of money, and many races won’t let you transfer your registration. Which is understandable since you would probably have hundreds of runners do this and cause even more work for your event staff. I guess it all comes down to Rule #1: Don’t Get Caught. No, but seriously, if you do run for someone else, don’t place and don’t sue the race staff if something happens to you. Because once they find out, they will not only blacklist you, they will also blacklist the person you were racing for. For life. It’s not worth the risk. The Before pic: all happy and dry and breathing. 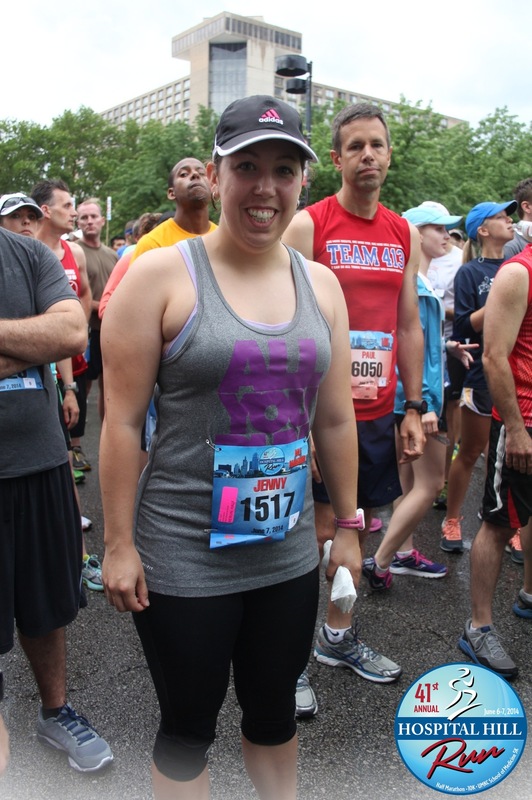 I wore my “All You Run Is Your Mouth” tank for Jason. He is a fan of the witty, friendly trash talk. I don’t know if HHR meant they would blacklist my mom for just HHR or all of racing in KC in general (how they would communicate that, I don’t know. Maybe they created a secret Facebook group of blacklisted runners and all racing directors check this list. Maybe they also post funny YouTube videos of cats on here, too). But it was a serious issue – and luckily HHR was understanding that I was just trying to do something nice for my mom who was being an awesome mom for her mom who was in the hospital. And it all worked out. Except my mom will probably never PR again. She’s got a sub 8-min mile pace to beat. 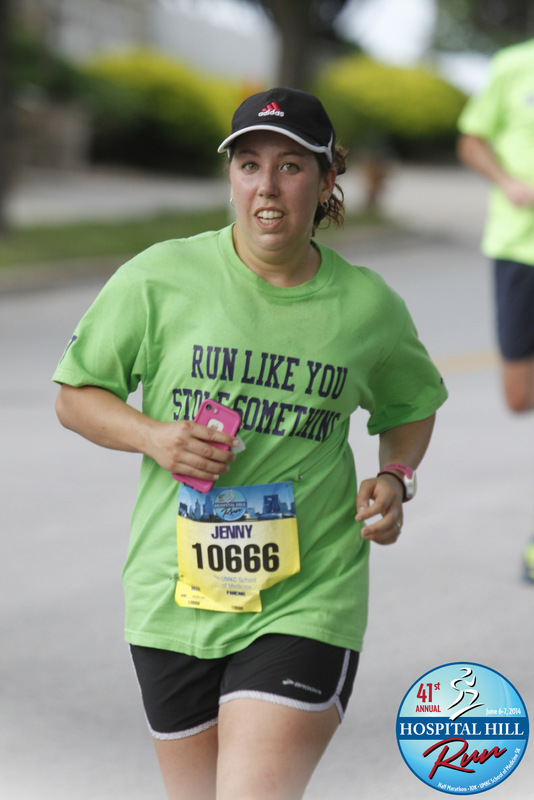 And for the record, Steffi would have gotten first place in our age group of 25-29. So she needs to come back next year and run it officially. Jason (on right) giving the thumbs up even though we are Completely. Soaking. Wet. P.S. We behaved ourselves for the half marathon. It was pouring rain and storming so the start was delayed a 1/2 hour. Which is why I will shamelessly plug why you should stay in a hotel for races you really like. We probably would have sat at home wondering if we should drive into the city and get soaking wet. 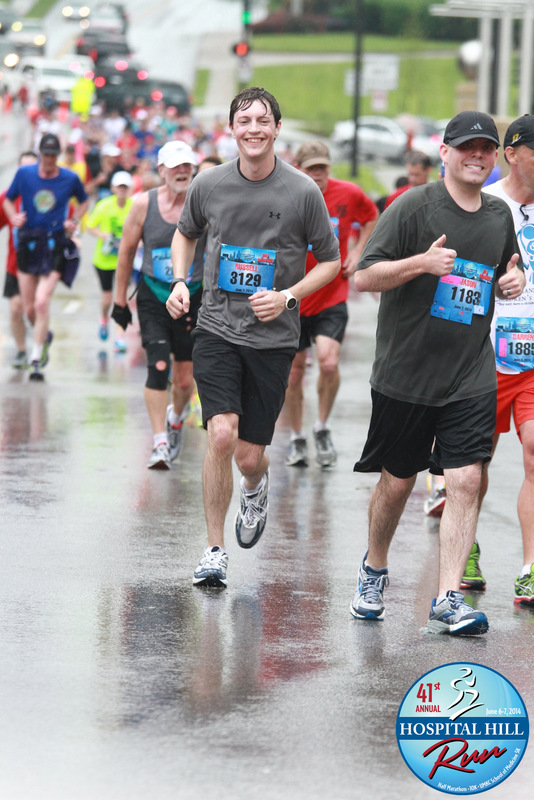 Instead, we were in the dry and warm Sheraton room looking down at the people in ponchos and wondering if we swam half the race, would it count as a duathalon? 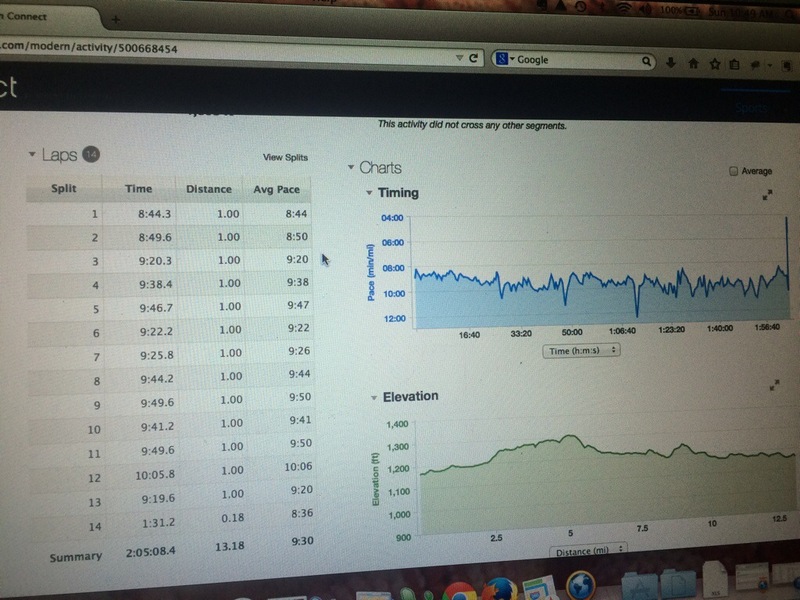 This top chart is the elevation chart for the Hospital Hill Half and below the chart for the Lincoln Half. Despite the rain and hills, I beat my Lincoln Half time. It was my second fastest half of 5 halfs this spring. And it was only 3 min slower than my fastest which was the super flat Garmin half marathon. THIS is why I am the Hill Master. 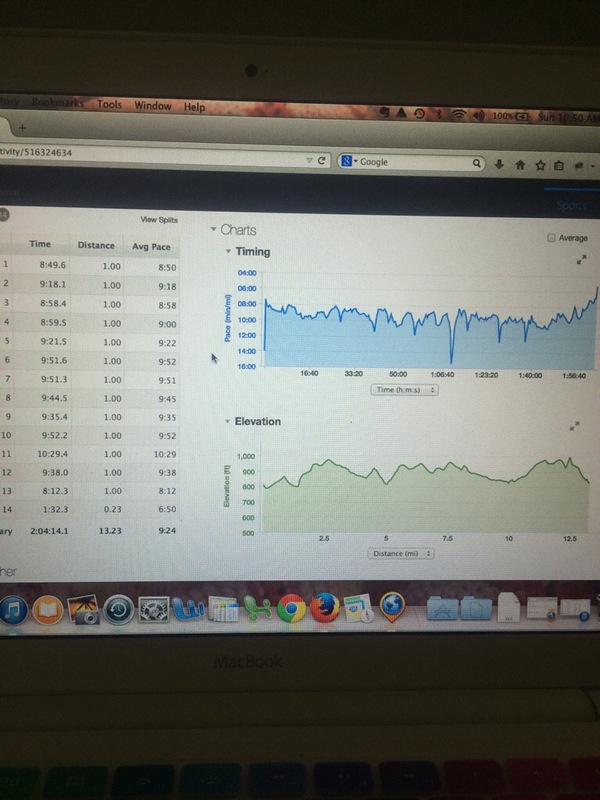 My Lincoln Half chart with much less hills but a slower time. 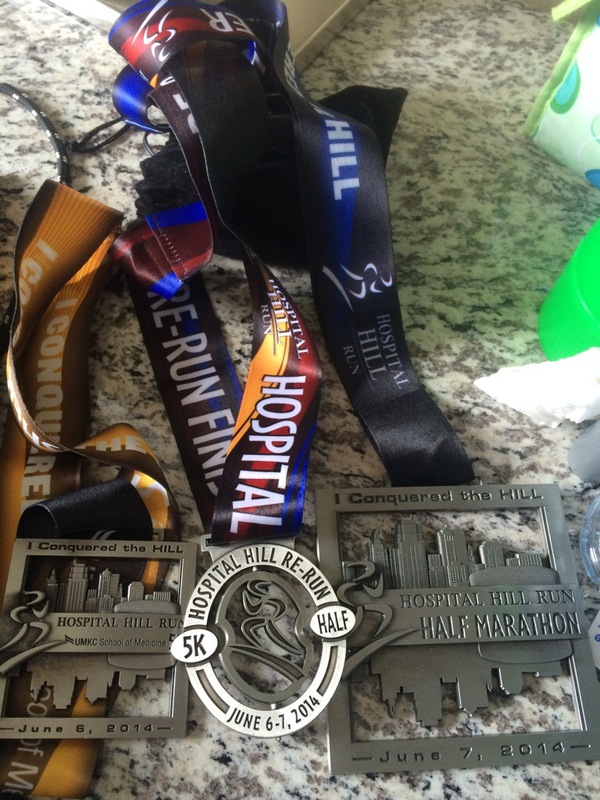 Posted on August 6, 2014, in Hospital Hill Blog Post, Humor, Lessons, Races, Running and tagged Half Marathon, Hills, Hospital Hill Run, Humor, Kansas City Races, Running. Bookmark the permalink. Leave a comment.